Katie Can Too! : Katie Can Too!! The end is near ... final training session at Bondi. Utterly terrifying. The waves were the bigger and the weather was more miserable than it had been yet. At least we all co-ordinated perfectly in our Can Too Cossies. The surf is so strong it rips my googles from my head whilst swimming. The waves at Whale Beach prove a let down after the serious surf the day before. This is where dangerous levels of complacency set in. Alice grinning from ear to ear that the conditions aren't as bad as yesterday. IRBs (or as I prefer to call them Rubber Duckies) getting ready. I desperately hope I don't have to use them. Massive Grins before the race starts. Ignorance is bliss. Waiting for the start gun. This is actually the worst part of the race. Having always been in the first wave I'm now in the 8th and by now the adrenalin glands have been working overtime. This is a fairly cautious back of the pack start. Normally it would be action shot central. I'm in the cautious bunch. Splashing up the beach like a pro. There is quite a bit of pain etched onto my face. There is also unbelievable relief at being able to touch dry land again. 1:01 hours later. I'm second last in my age category and 1639th out of 1831 overall and I'm pretty sure I wouldn't have felt better even if I'd won the damn thing. Waiting at the finish line are a few representative members of Team Katie. Mum and Dad. They were almost as proud as I was. More representatives of Team Katie. Em and Tom trekked to Whale to be there when I crossed the finish line. They told me they could never do it themselves. 3 months ago that was my attitude too! But there was no way I couldn't succeed with all the support I had behind me. To everyone who encouraged my madness - thank you. To everyone who said congratulations, or good luck. And to those wonderful, wonderful people who dug deep and sponsored me, I cannot thank you enough. I assure you I thought of you all multiple times during the swim (there was certainly time) and it gave me strength. 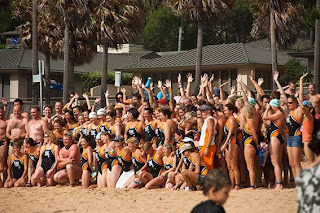 Can Too Swimmers and Cure Cancer Board Members. Club Fed. Totally Euphoric. Early, early start for the Big Swim. Knocks all previous efforts out of the ball park. By the time we park, get a coffee, get the bus to Palm, register and warm up there's about 10 minutes left. Having lost my googles the day beforehand (they went to a watery grave) I have to use my spares and they're leaking. Not good. Lots of faffing waiting for our wave. They start 80% of the blokes and then the women. So much for chivalry. Decent start. Head to the first buoy / boee and then try to sight the next one, as per our Can Too briefing. Have to wait until Whale Beach for the next one. The headland between Palm and Whale Beach is endless. So to kill time I start singing "This is the headland that doesn't end, it just goes on and on my friend. Some people started swimming it not knowing what it was and they'll continue singing it for ever just because ..." In retrospect it seems equally appropriate. It's about this point that the googles start going really wrong, I start getting seasick, I get stung by sea lice to which I am allergic, the waves seem utterly relentless and determined to smash me into smithereens on the headland. Finally get past the headland and can see the beach, but they make you swim all the way along to the buoy / booee and then swim back. 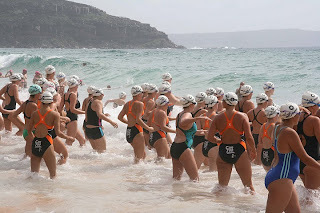 I swim as fast as possible to the finish and am so relieved to touch solid land I could cry. Am bathed in the warm feeling of support from my Dad, who is waiting at the finish line and all the fellow Can Tooers. I'll be back next year. The next weekend was supposed to be the Cole Classic but a combination of weather and the drive from Jervis Bay turned me off. 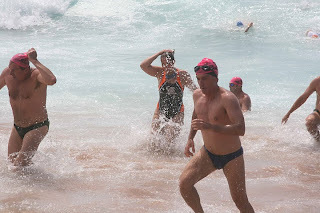 So I've signed up to the North Bondi Classic to make up for it. 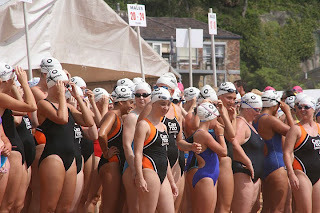 And am actually considering doing the 5km Coogee to Bondi swim! This Can Too attitude is infectious. And all the wonderful support is totally addictive.